Davis and Chaz are two detectives assigned to a very unusual division: the Snapshot division. Thanks to some sort of flobltinum, a psychic being can accurately recreate any day in the past. 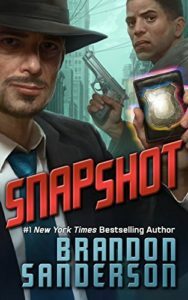 Davis and Chaz’s jobs are simple: to enter the snapshot and confirm details of crimes that have already happened to ensure the bad guys are caught. Only catch, they have to keep their actions from altering the recreation. Everything they do has consequences, creates divergences. If they do too much, they might never figure out what happened. And today, the stakes have never been higher. They have a chance to catch a serial killer who’s doing all he can to evade the Snapshot program. This short story is why I love Brandon Sanderson. He is always coming up with new and exciting stories to read. He’s not locked into one fantasy universe or even one genre. He’ll write in them all to share his imagination with us. And Snapshot is no different. This time, he delves into the murder mystery with his own style. He’s put that Brandon Sanderson spin on this tale and makes it wonderful. This is a great one that will keep you reading through its various twist and turns. For fans of speculative fiction, this novella is a must read!